Buddhist Pilgrimage Tour starts from Mumbai. Our representative welcomes you at Mumbai International Airport and escorts you to the hotel where you spend the night. Morning, leave for the Ajanta Caves and spend the whole day there. Later, proceed to the Jalgaon railway station where you will take the onward train to Bhopal. Overnight in train. Welcome on arrival at Bhopal station by our representative who escorts you to the hotel. Later in the day, leave for a visit to Sanchi that is the revered home to the majestic Stupa. Return to hotel for the night. Continue your Buddhist Pilgrimage Tour to Agra. Board the scheduled train to Agra from Bhopal station. Check in to hotel on arrival. Evening visit the unique monument of eternal love - Taj Mahal. Overnight at hotel. Spend the day visiting the major tourist attractions of Red Fort and Itmad-ud-Daulah's Tomb. Then proceed to Agra airport to board connecting flight to Varanasi, one of the famous sites for Buddhist pilgrimage. Our representative welcomes you at the airport and escorts you to the hotel for a night stay. Take a pleasant boat ride along the picturesque Ganges river in the morning before proceeding to Bodhgaya. Stop for a while at Sarnath on the way to get a glimpse of rich Buddhist heritage. Transfer to hotel on arrival for overnight stay. Buddhist Pilgrimage Tour today proceeds to Patna. Visits to Rajgir and Nalanda midway. Check in to hotel upon arrival and stay the night there. Check out from Patna and head to the airport where you take the onward connecting flight to Delhi, the last stopover for your Buddhist Pilgrimage Tour in India. Welcome on arrival and transfer to hotel for a night stay. Morning, leave for a post-breakfast city sightseeing tour that takes you to the major historic landmarks in Old and New Delhi. Drive to the airport and take the scheduled flight back home or for onward destination. Buddhist Pilgrimage Tour ends. 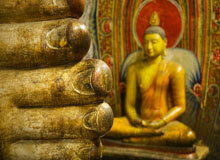 India Profile offers online information and booking for Buddhist Pilgrimage Tour, India. For more information or to book your tour, please fill up the form given.